Our favorite Christmas songs, whether they’re traditional or modern, embody some of the best aspects of the holiday. This season, impress your guests with unique Yuletide party themes inspired by beloved Christmas tunes. Let everyone’s favorite reindeer guide your holiday decorating and entertaining theme this Christmas. Use reindeer-themed ornaments on your Christmas tree, but keep it elegant by sticking to a single color family, such as red, silver, or gold. Brighten your tree with red and white Christmas lights by swapping out a few clear bulbs with red-colored ones. Create these handmade reindeer paper chains and use them as adorable Christmas mantel decoration. For a fun and easy appetizer, make cute reindeer faces with Laughing Cow cheese wedges, black olives, pretzels, and red peppers. For dessert, try this recipe for Peanut Butter Reindeer Cookies from Bakergirl. These cookies are simple to make, scrumptious, and super cute. Bright red drinks help make your party theme pop! Cranberry cocktails, strawberry daiquiris, and raspberry martinis are great options. This lively Hibiscus-Honey Iced Tea has a lovely red color and contains a bit of light rum for a nice little kick. If you’re planning to host a Christmas party at home, make sure it’s stylish, stress-free, and bursting with Christmas spirit. 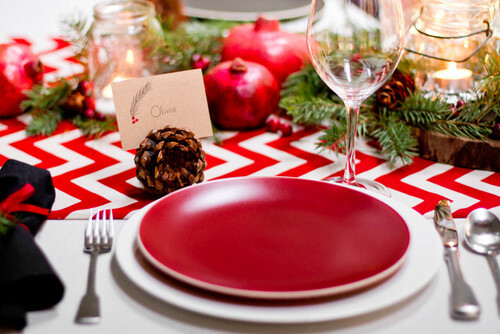 Throw the hottest holiday bash without breaking a sweat with these quick and simple Christmas party ideas. To keep your party manageable, limit your guest list based on the size of your dinner table. Any more than 6 will usually require catering, so be sure to invite only those you really want to spend the evening with. Be sure to send out invitations three or four weeks in advance as people’s calendars can fill up pretty quickly. Prepare your menu and a corresponding shopping list, and then plot down a schedule for cleaning the house, doing the groceries, setting the table, and cooking the dishes. Christmas is often characterized by feelings of abundance, but you should avoid over-decorating. Instead, limit the celebration space to three focal points, such as the Christmas tree, the food table, and the fireplace. A lit fireplace makes your home warm and cozy, but if an open fire is not an option, you can cluster together tea lights and candles to create a relaxing mood. For your table setting, choose a color scheme from your holiday decorating palette and apply this to your centerpiece, table runner, and napkins. Try to use space saving tabletops such as a small floral centerpiece to avoid overcrowding the table. Don’t forget the music playlist to enhance the fun party atmosphere.